Dry Grapes/Raisins/Kismis/ Munnakka is a popular dry fruit which is a dried form of grapes. It’s loaded with essential nutrients like calcium, iron, potassium and most importantly fiber. Raisins are used for various medicinal purposes to heal digestive disorders, chronic constipation, treating fever in babies, toddlers, kids and even adults. In this post, I have given details about the health benefits of raisins, how to introduce dry grapes to babies, how to select them and the method of preparing dry grapes juice/ dry grapes water/ raisins water at home. Raisins are excellent digestive aid which helps to reduce common gastrointestinal problems in children. Helps to prevent early tooth decay and gum disease as raisins have antimicrobial phytochemicals that reduce oral bacteria, according to one study. Excellent source of minerals which is vital for kids development. Dry grapes are also ideal during cold/fever which helps to recover quickly from the illness. Dry Grapes/ Raisins can be included in babies diet from 6 months. When you begin, you can give as dry grapes puree/ juice/ raisins water. Once the baby starts chewing well, you can offer mashed/crushed/ chopped raisins as finger food. Always choose organic dried grapes/raisins for babies which are sulfate free. You can give both black raisins and golden raisins to your baby. 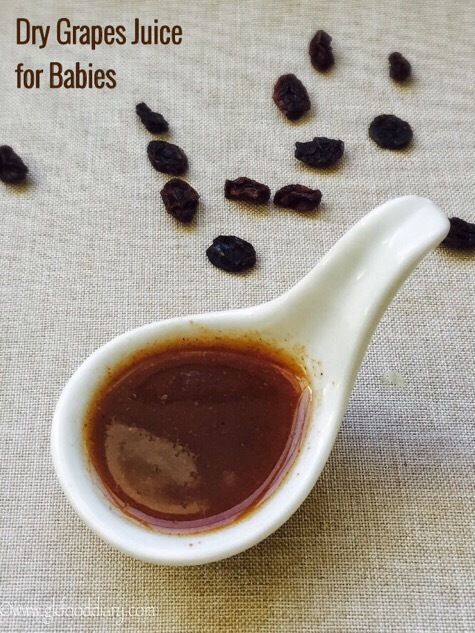 For babies below one year, you can offer a tbsp of raisins. When you introduce dry grapes juice/raisins puree, feed only 2-3 tsp per day at the maximum. Gradually increase the quantity to 2-3 tbsp. For babies above one year, you can give 2-3 tsp of raisins per day. Also, it’s recommended to give dry grapes in the form of juice only when the child is severely constipated. Otherwise, prefer mashed/whole raisins according to age. Choose organic dried grapes for baby food. 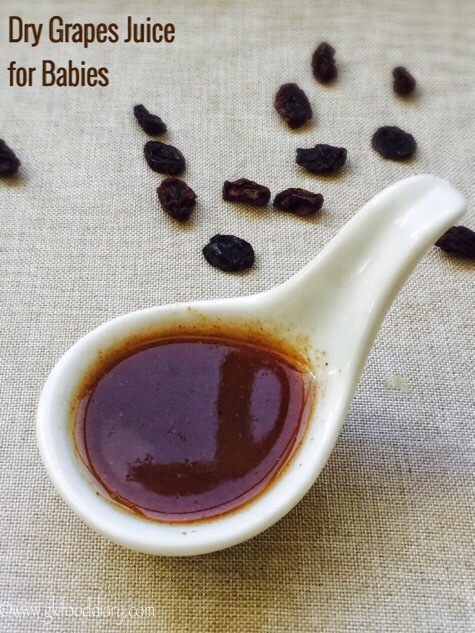 Always rinse the raisins thoroughly before using for any baby food to get rid of chemicals if any. Prefer juice of dry grapes/raisins to your child only when he/she is severely constipated. Don’t add more water while preparing this juice. 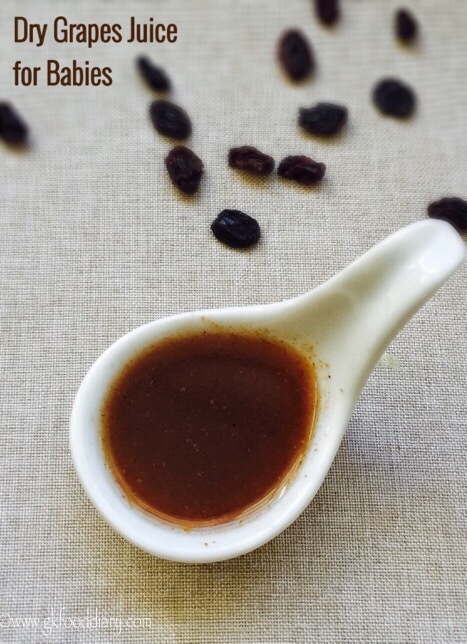 You can add pureed/ crushed/mashed raisins to any baby food as a natural sweetener. Now let’s get on to check how to make dry grapes juice or raisins water for babies, toddlers, and kids. 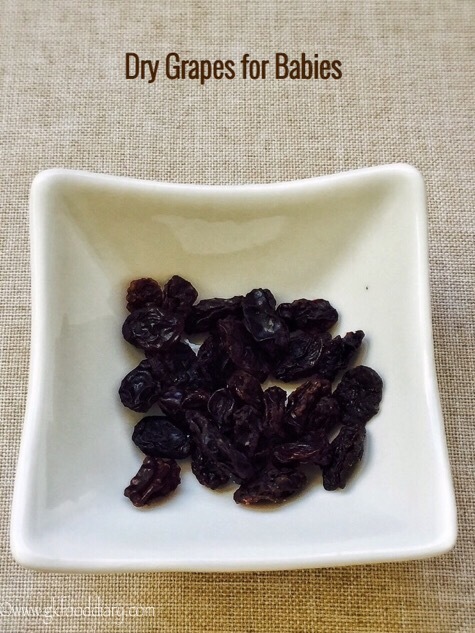 Raisins for babies, toddlers and kids - a detailed post on the health benefits of raisins, how to make raisins water or dry grapes juice at home. Measure and take raisins. 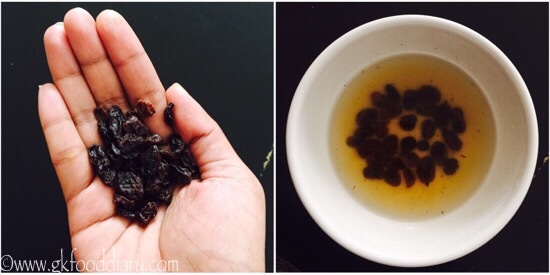 Rinse the raisins in running water well to get rid of the traces of chemicals if any. Soak the raisins in water for 4-5 hours at least or overnight. Once the raisins are soaked well, grind them along with jaggery (if using) in a blender with the water used for dipping. Grind it to a smooth paste. Strain the juice using a filter. Serve immediately. 1. Measure and take raisins. Rinse the raisins in running water well to get rid of the traces of chemicals if any. Soak the raisins in water for 4-5 hours at least or overnight. 2. Once the raisins are soaked well, grind them along with jaggery (if using) in a blender with the water used for dipping. Grind it to a smooth paste. 3. 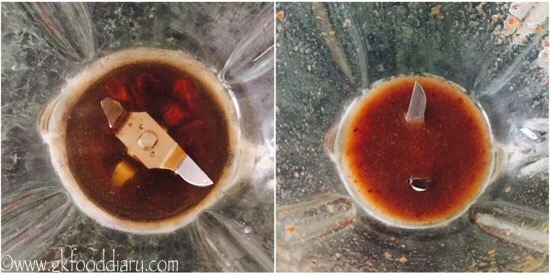 Strain the juice using a strainer. Serve immediately. Dry Grapes Juice is ready to feed your baby. Begin with the small amount and always serve dry grapes juice when in need. 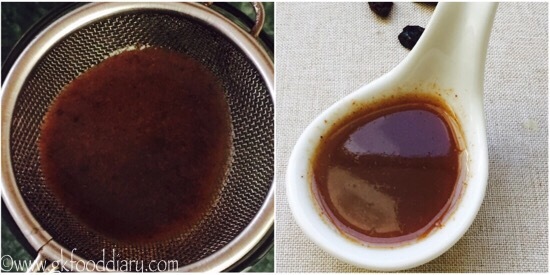 The soaked raisins water (after extracting the juice with your hands) can be given too instead of grinding them in a blender. Don’t add more water while preparing this dry grapes juice. You can also add this dry grapes juice in the little amount to any baby food as a natural sweetener. For babies below one year, give plain dry grapes juice without any sweetener. Hi my baby is 7 month old but she dont drink plain water….hence today i gave her dried black grape water and she drank happily…can i give this water everyday instead of plain water? you can give dry grapes water once in a day. giving too much of dry grapes water is not advisable and it may lead to loose stools in some babies. if baby is taking breastfeed, more plain water is not required. My baby is 14 months and poops a lot. Can I give her only the water in which raisins have been soaked overnight. Will that also lead to loose stools. I want her to have the nutrients but not the fibre. My lo (2 year old) gets constipated all the time. He wont take the dry raisins water directly. Can I add this into his morning oats+fruit puree? Will that help with his constipation? Also, how much water should I mix? Can I refrigerate the remaining water? Hi, my son is 2 months old and it’s been 5 days he has not pooped. Can I give him this raisins water? After grinding it into smooth paste, does it needs to be strained ? Can the paste be given directly or mixed in the food without straining ? Any specific reason why the paste needs to be strained (as we wash the raisins before soaking in water) ? As we grind with more water, sometimes raisins won’t grind smooth. There may be small tiny pieces left unground which baby may choke. Hence I recommend straining. I wanted to add raisins puree in the milk on a daily basis for my son to see if that helps with his constipation. Wanted to know if I prepare the rasins puree as mentioned in this recipe, for how many days I can refrigerate ? 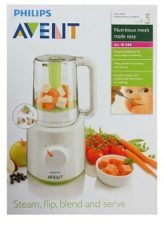 Is the baby is having digestion issues, gently steam the fruits like apple, pear, papaya, etc. for 5 minutes and offer. Also include banana, yogurt, and ajwain in a small amount regularly. my son didnt has digest problem.and has watery stool.he is so weak.may i give this raisin huice to my son.also he refuses to eat any fruit.how to give him fruit. This is not suitable for kids with loose motion. Hi… My 1 year old baby has milk and nuts allergy shall I introduce dry grapes juice to her.. Her weight is not increasing she looks so lean.. Try dry grapes in small quantity after consulting with a doctor. Don’t worry about weight if baby is active and doing well, However, For weight gain include foods like banana, potato, sweet potato, ghee, urad dal, chicken, eggs, sesame seeds, avocado, raw banana powder, cheese which helps in healthy weight gain…(in any form your baby prefers).